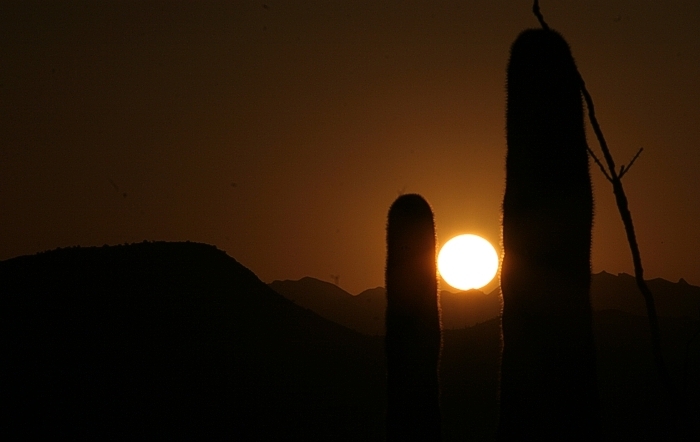 This photo captures the Sun, at the moment of sunset, exactly between two large saguaro cacti. At first glance, it appears to show a remarkably accurate alignment of terrestrial and celestial objects — like what observers routinely witness at Stonehenge in England. But in this case, it was simply a matter of where I positioned my camera. Still, there is some interesting science behind the photo, and it’s my job to talk about that. First, this was one of many test photos I shot before doing that time lapse sequence for my May 13, 2013 post about fake sunsets. I positioned the camera based on output from my astronomy software, which can tell me where the Sun will set. There’s these two majestic saguaros just west of my home, so I tried to frame the sunset between them. As you can see, I got lucky. Well, it wasn’t all luck. The astronomy software I use is one of many available free apps that show you exactly how the sky will appear at any time from any place. All you need to do is enter your location’s latitude, longitude, and elevation, and the software does the math. It creates a graphic of the sky in any direction you choose to view. You can get your exact location data from Google Earth if you have an up-to-date browser. Now look at what’s happening to the cactus needles on both sides of the Sun. They appear to be glowing. Cactus needles are like tiny translucent spears. They evolved to protect the cactus from harmful fauna — not for shade or photosynthesis. The light from behind makes them glow with the same color as the Sun. It is, in a sense, an organic Sun Dog but with minimal dispersion of colors. Needles on the other sides of the cacti are barely visible in silhouette against the sky. A final note about the deep orange sky color: It was windy that day and there was a lot of desert dust in the air. Even on a clear day, sunsets show more oranges and reds. This is due to Raleigh scattering. And the presence of dust in the air enhances that effect. It makes for a beautiful sunset, but wreaks havoc on my allergies. Thank you Shannon. Sky Lights isn’t always just about “pretty pictures,” but in this case I made an exception.